It might be more helpful, at least at first, to explain why I didn’t write Do Ask, Do Tell, Let’s Talk (which releases March 8th). 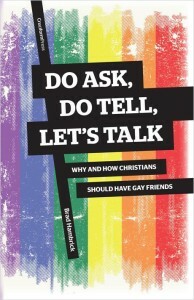 I didn’t write this book because I believe homosexuality is the most important or pressing issue of our day. Actually, to the contrary, I wrote this book because it is my perception (accurate or not) that part of what complicates the subject is that only people who are very passionate about it have the courage-boldness-audacity (whatever you prefer to call it) to speak or write on it.